The command consists of an officer, standard bearer, drummer, sapper and two NCOs. The box contains heads for all figures with either helmets (the helmet was last used in 1809), shakos (used from 1809-15) or the Landwehr corse-hut. Although the figures are designed for 1809 onwards as they have the 1808 higher-waist coat, you could use them for the 1805 campaign if you ignore that detail. 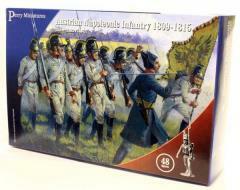 There are 48 figures in the box, two flags, unit bases and a full painting guide.